What’s on your bucket list? Have you ticked any of those things off yet? Well, my next guest’s bucket list involved things like scuba diving in Papua New Guinea, racing Lamborghinis in Italy, and volcano boarding in Nicaragua. Just so you know, he’s ticked all of those things off already And now he’s made a job out of it, as an author, among other things. Robin Esrock’s latest book is called the Great Global Bucket List, and it’s the result of his adventuring in more than 100 countries, and his journey began in a way different to how you might think. 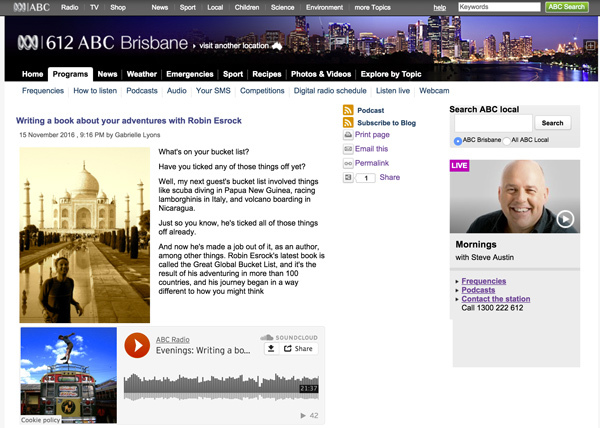 Click here to listen to an interview with ABC Brisbane.